JPSS-1. Image Credit: Ball Aerospace & Technologies Corp.
Boulder, Colorado. February 3, 2014. Ball Aerospace & Technologies Corp. has successfully completed the SpaceWire Inter-operability Test for the Joint Polar Satellite System-1 (JPSS-1) satellite and has begun spacecraft bus integration. Ball will power-up the spacecraft for the first time later this month as build progresses toward an early 2017 launch. JPSS-1 will provide continuity for accurate predictions of severe weather currently provided by the Ball-built Suomi National Polar-orbiting Partnership (Suomi-NPP) satellite launched in 2011. JPSS-1 was procured by the National Oceanic and Atmospheric Administration (NOAA), through the National Aeronautics and Space Administration (NASA). “With the SpaceWire risk reduction test behind us, we have initiated spacecraft bus integration and are proceeding ahead of schedule toward instrument integration in November of this year,” said Cary Ludtke, vice president and general manager for Ball’s Operational Space business unit. SpaceWire is a spacecraft high-speed communications data-handling network. The JPSS-1 test was a risk reduction activity to provide early verification of the network’s architecture design and implementation. 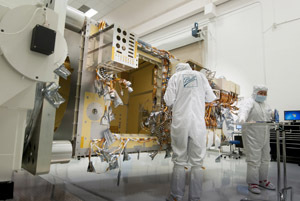 SpaceWire, which replaced the IEEE1394 architecture used on Suomi-NPP, helps reduce system integration costs and promotes compatibility between spacecraft data handling equipment and the onboard Visible Infrared Imaging Radiometer Suite (VIIRS) and the Cross-track Infrared Sounder instruments (CrIS). The scope of the SpaceWire Inter-operability Test, conducted under both normal and fault conditions, proved the functionality of links using flight-like engineering models of key JPSS-1 spacecraft bus subsystems and engineering models for VIIRS and CrIS. The three additional JPSS-1 instruments include the Advanced Technology Microwave Sounder, the Clouds and the Earth’s Radiant Energy System, and the Ball Aerospace-built Ozone Mapping and Profiler Suite (OMPS). Ball is under contract to NASA’s Goddard Space Flight Center to design and build the JPSS-1 satellite bus and the OMPS instrument, integrate all instruments, and perform satellite-level testing and launch support. JPSS-1is a polar-orbiting satellite that will provide the National Weather Service critical data to forecast severe weather events up to 10 days in advance, aiding our Nation’s leaders, decision makers, emergency managers and media to better provide increased warnings to the public. Polar satellites ensure that the U.S. provides stable and continued access to weather information.